You never know how much you don’t know until you learn or experience something new; this statement has never felt truer than now. 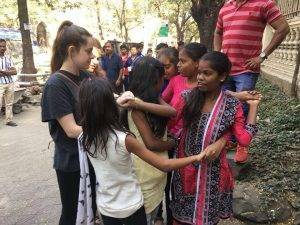 As my fellow Nativers and I have travelled on an astonishing and formative journey throughout Mumbai with Gabriel Project Mumbai (GPM), we have suddenly discovered how much we didn’t know about society and life in India just three weeks ago. 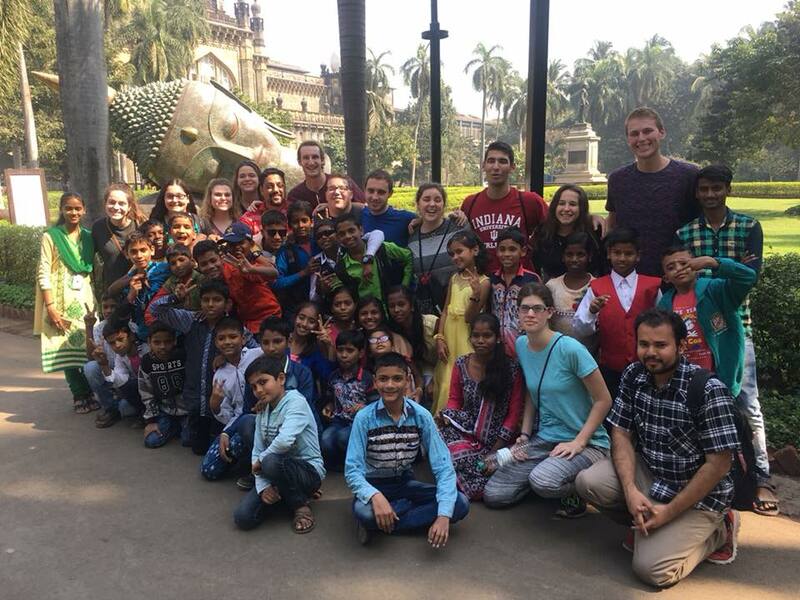 During the past three weeks, we’ve been immeasurably fortunate to explore the niches and overarching aspects of Mumbai’s vibrant and conflicting culture, from volunteering and learning in the slums of Kalva to delving head first into India’s Jewish community. Throughout it all, we have furthered our understanding of the world and our place within it. Our first day in the slums of Kalva was mentally taxing. As we walked from the train station to the GPM learning center located inside the slum, I was disturbed by mountains and valleys of waste, young children defecating on piles of trash, large pigs roaming everywhere, and dilapidated living structures. I felt waves of guilt roll over me as I walked along the dirt path thinking about my own upbringing, current way of life, and probable future way of life. Why am I so lucky to always have a functioning toilet and to never wonder about my next meal and to have a doctor to go to when I get sick and to have teachers who teach me how to think critically? And even one step further: why am I so lucky to have a swimming pool at home and have my mom’s chocolate raspberry bars always waiting for me in the freezer and to have a car to drive and to have a perfectly functioning iPhone? Why am I blessed with all basic human rights plus so much more when countless people lack even the basic human rights of healthcare, nutrition, and education? I had had all these thoughts countless times before coming to India, but now these thoughts were so suddenly so real, so tangible. Throughout our first day in Kalva, I continued to struggle to make sense of the discrepancy between my life and the lives of those in Kalva. However, my thoughts began to settle a little when witnessing the powerful dynamism and potential of GPM in action. GPM is an oasis of support and comfort for many Kalva residents, specifically for the students that attend GPM’s school for grades 1 through 10. GPM’s goal is to teach the kids topics beyond math and English, which they already receive from their normal school education; instead, GPM stresses the importance of thinking outside the box and creative problem solving, providing the students with necessary tools to reach their full potential and to help break the cycle of poverty. We were given the wonderful opportunity to work with the students in grades 1 through 4, with 3 of us in each classroom. My partners, Ben Padnos and Noah Lee, and I worked with the fourth graders and we decided to fill our six lessons teaching about systems from small to big scale: cell, human body, society/nations, earth, solar system, and universe. Our goal was to teach the children that everything works in a system; everything is part of a greater picture and nothing should be blindly accepted without questioning it. With each new lesson, the children better understood that they play an essential role within all the systems we discussed. For our first lesson, we taught the students about cells, a brand new idea to them. We explained that cells are the base of all life and function just like a protein factory, with each organelle having a separate, crucial role in producing a protein. In order to bring the idea of a cell to life, we turned the classroom into a fully functioning cell! The system began when 3 students blew up balloons (energy) and ran them over to 3 students, who unwove a string sewn into a piece of paper (unzipping DNA); that string was passed to 3 more students who wove it through another piece of paper (creating RNA), which was passed to 3 more students who had to fold and put their signature on the woven paper (protein structure formed), which was then passed to the 3 final students who had to check and ensure everything looked perfect before throwing it out the door (cell membrane). The first time we went through each step of the cell’s system, the complexity proved a little challenging for the students, but by the second and third rounds, the concept began to click and they were operating purely on their own! All in all, our classroom cell produced 8 proteins that day! When teaching and reviewing the concept of the cell, it was wonderful to see that the students understood what we were doing. During our sixth and final lesson, I finally understood how important our work with the GPM students was. We taught all about the universe. The children had never before heard about the universe; therefore the lesson both blew their minds and forced them to think beyond their understandable world. However, what was craziest about this lesson is that we were also teaching the classroom teacher; she had also never before learned about the universe. Now, when the fourth graders grow up, they will have the knowledge and capacity to teach others about the universe and their place within it. The three other grades covered an immense range of other topics: human identity, animals, states of matter, adjectives, world cultures, team bonding, vehicles, creativity, rhyming, careers, and many more. Throughout our six days volunteering in Kalva, my staggering guilt slowly dissipated and was instead replaced with an overwhelming sense of obligation to use my position in life to help others. I am still just as confused about why such sharp contrasts exist and I don’t think I will ever understand why they do; all I do know is that I can do my part to help. On a completely separate note, exploring India’s Jewish community has been a whole other journey that has greatly altered my perception of global Jewry. Before coming to India, I was not even aware that India had a Jewish community! In fact, I had a very limited understanding of Jewry outside of North America. Delving into India’s Jewish community has shown me the complexity of my religion. The history of the Jewish people in India is both intriguing and unique. The first Jews came to Cochin, India and flourished into a large community there during the time of King Solomon (around 950 BCE) because a major trade route was located there. Then, during the destruction of the Second Temple in 70 AD, a group of Jews came on a ship from Israel headed towards Cochin in order to escape persecution. However, their ship crashed on the Konkan Coast of India before reaching Cochin and the 14 survivors established themselves there. From those 14 survivors, the entire Bene Israel Jewish population was born. From just those 14 survivors, the population reached its peak almost 1,900 years later in the year 1948 numbering 20,000 Jews. Additionally, in 1750, Baghdadi Jews made their way to India because of religious persecution and commercial reasons. However, today, many Indian Jews are choosing to move to Israel with 70,000 already there today (over 1% of Israel’s population) compared to the 4,500 Jews in India today. 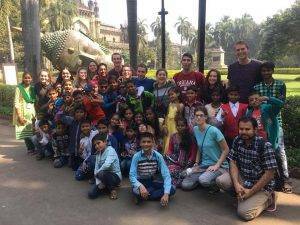 Understanding the fascinating history of the Jewish people in India gave context to our first hand exposure to India’s Jewish community, making our experience more impactful than it would have been otherwise. Chabad has acted as our home base, where we’ve had our sessions on lesson planning, international development, and Hindi (aap keseh heh? = how are you?) as well as where we celebrated our first Shabbat. It’s very delightful in an intriguing way to always see Jews from India, Israel, the U.S, and all around the world doing different things all around the Chabad house of Mumbai! We also had the opportunity to go to Mumbai’s joint JCC/JDC building, where we learned about JDC’s role in Mumbai’s Jewish community and also got to learn some Bollywood dancing from Jewish youth! We also went to explore the Konkan Coast for a day, where the ship carrying Jews headed for Cochin crashed nearly 2,000 years ago. We first visited the Jewish cemetery, which was used by the 14 survivors to bury the passengers who died in the shipwreck and has been used ever since. Even today, when someone from the remaining 15 Jewish families living on the Konkan Coast passes away, they are buried there. We also visited Beit El synagogue, which is still active today. We all had to take our shoes off before entering, much like is done in Hindu temples, exemplifying one way Indian culture has worked its way into Jewish rituals. After a tasty lunch in the middle of town, we visited Elijah Rock, where it is believed that Elijah the Prophet ascended to heaven. As the day continued, I found myself in more and more disbelief that a part of my religion was present and active on the Konkan Coast of India, when just three weeks ago I didn’t even know Jews lived in India at all! We spent our last Shabbat in India with India’s Jewish youth group, JYP (Jewish Youth Pioneers), at their winter Shabbaton. We spent the weekend meeting and bonding with the 25 young adults through different learning sessions, fun activities, and free time. For instance, we had a session on how to write a Dvar Torah, a session on the Holocaust, a night of Bollywood dancing, free time to swim in the pool, and much more! It was interesting to experience Shabbat with JYP because they follow an Orthodox, Sephardi style of praying which is very different than what I am used to; however, I used this opportunity to expand my understanding of what Judaism is and to further my appreciation for the Conservative Movement of Judaism. We also had the opportunity to explain what the Conservative Movement is to the JYP members because they had never been exposed to it before. Overall, it was amazing to learn and grow from each other. Throughout the entire weekend I was blown away just being a part of JYP’s Shabbaton because just three weeks prior I didn’t even know India’s Jewish community existed! I want to thank my parents for sending me on this trip, Yossi for finding, opening, and working out all the details of this trip, Jacob Sztokman for founding GPM and making it thrive, Nikkita, David, Dennis and the rest of the GPM staff for working with us every step of the way, and Adina for tolerating us. Also, a special thanks to Repair The World! I want to thank you all and my fellow Nativers for awarding me with the opportunity to realize I knew so little about India, the Jewish people, and myself only three weeks ago.